Create engaging eBooks with 3D page turning effects, from your local PDF files in some simple steps, using the Flip PDF software developed by Flip Builder. This is an excellent tool for eMagazines, Cookbooks, or Business Presentations, that can be seamlessly read on any device, from desktops, televisions, mobiles and tablets. Learn the basics of 3D book making with the Flip PDF Pro. To start with the awesome idea, first launch your Flip Builder Pro software, and from the main window, import the PDF file of your book. The import itself is going to instantly turn the PDF pages into a flip through book. All that you need to create a 3D book, can be found at the “Design Settings” and “Page Editor” sections. 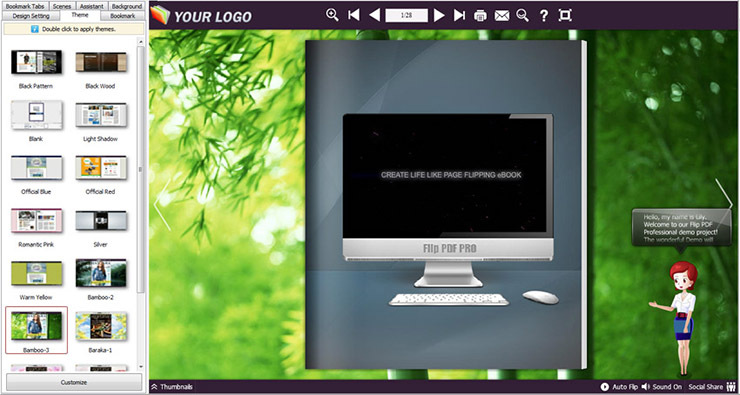 First of all, arrange your images in your desired layout. Next up, go to “Action Options” for essential effects like “zoom in and out” and “Fade In and Out”. 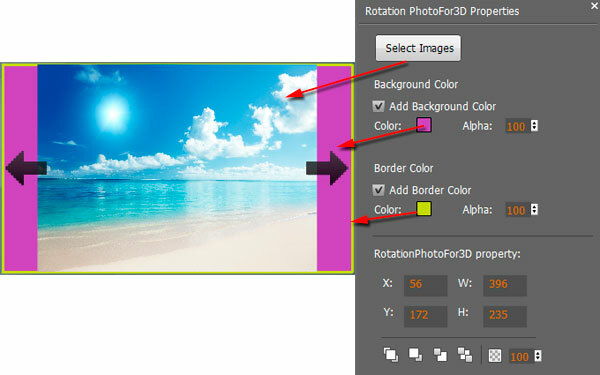 Now, go to the “Rotation PhotoFor3D Properties” and add your images to with the flash effect. Just double click on the “Rotate” icon, and it will automatically launch the feature. The arrow buttons are used for changing the images. You may add SWF flash into specific areas of your 3D book, to define certain elements or narratives in your book, you can choose from a variety of SWF files to make it suitable for the topic of your 3D book, and pick objects like leaves, butterflies, flowers and birds among many others, to make your story more lively. You can add interesting Templates to your book, to go with the 3D projection. Go to the “Template” section” in “Edit Pages” and choose from an array of templates as is suitable for your 3D Book. Then, you can choose from the available “Themes”. Next up, you can set the background in the same panel. Just scroll down the options of each, and click on them to preview the design. You can also add a “Background for your book, including logos, or watermarks. 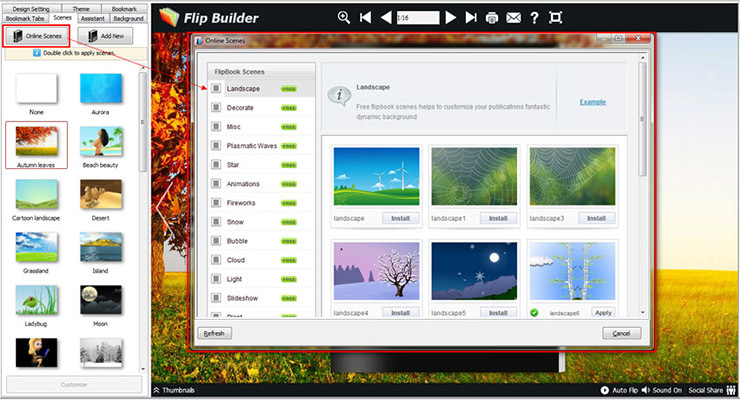 You can choose from existing backgrounds, download from the FlipBuilder library or upload your own images, as per personal preferences. Another feature you could use in 3D flip books, is the “Scenes”. While the “Background” features inserts an image at the back of your content, the “Scenes” sets a backdrop for the reading interface of the book. This adds a different ambience to the readability of your 3D book. There are a host of scenes to make it worthwhile, including animated backgrounds like falling autumn leaves, snowing, marine world, and lots more. If you want the touchup of certain text popups, or tips or even audio inputs, you can take help from the “Assistant” feature, that has some cool tricks to make your book full of interesting and informative elements. You can expect a 3D book, that glides the pages with a click of the mouse, or swish of a drag at the tip of the pages. Added with invigorating features of 3D backgrounds, scenes and even audio-visual effects, you can make your digital content to stand apart and bring out amazing depth in stories. To publish your 3D eBook, there are multiple output programs supported by the Flip programs. You can choose from EXE, HTML, Zip, Mac App, or Mobile version; or Burn it into a CD or DVD. The option of HTML will make your book viewable online and across diverse devices, with one time upload. Moreover, you can even send your 3D eBook as an email, as an HTML file. To publishing, just select from the arrow under the “Publish” button in the toolbar menu. 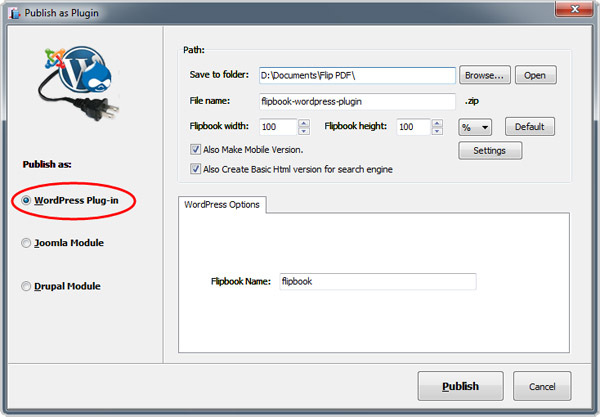 You can otherwise select the option of “Upload Online” to publish in the cloud platform of your Flip Builder account. From thereupon you can share your book at various platforms, including websites, social media and emailing.